Former professional hockey player and RIT alumnus Luke Murphy is the author of <i>Dead Man’s Hand</i>, a crime thriller that has been described as a “fast, gritty ride,” by <i>USA Today</i> bestselling author Anne Frasier. Becoming a published novelist was one of the farthest things from Luke Murphy’s mind as he skated up and down the Frank Ritter Memorial Ice Arena during his time as a player on the RIT men’s hockey team. 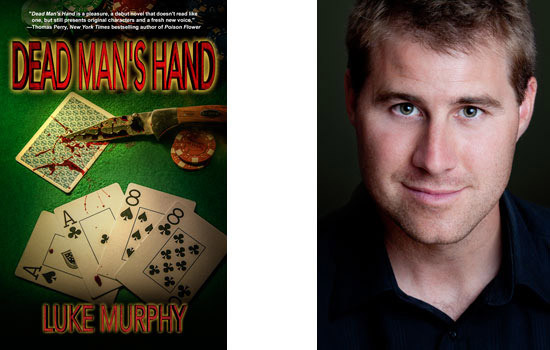 Nearly a decade and a half after graduating from RIT, Murphy ’99 (marketing) has released his debut novel, Dead Man’s Hand. The crime thriller tells the story of an aspiring professional football player named Calvin Watters who gets framed for murder in the fast-paced world of the Las Vegas gambling scene. The concept of a would-be professional athlete is a familiar topic for Murphy. Growing up, he was determined to become a professional hockey player—a goal that he would realize shortly after his graduation from RIT. 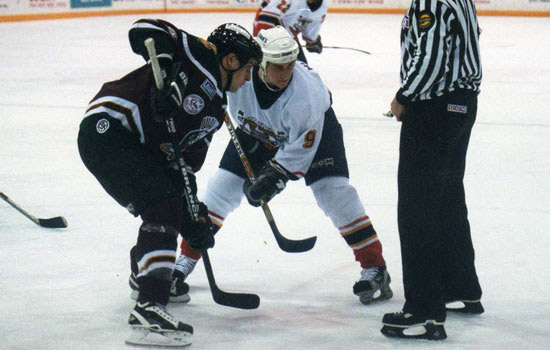 Murphy, who had a successful collegiate career under former RIT hockey head coach Eric Hoffberg, was invited to an NHL training camp with the Florida Panthers after graduating. He played several pre-season games with Florida before an injury put him on the sidelines and put his career in jeopardy. He was granted a second chance and received a minor league contract, and for the next six seasons he was moved around from team to team. “I got to play in some great cities,” he says. “My hockey career was a fun ride, but it was one that had to end.” At age 29, Murphy decided to call it quits, citing a series of injuries and his desire to settle down with his wife as factors in his retirement. After moving back to his hometown of Shawville, Quebec, Murphy was faced with the difficult task of starting a new career. Armed with his hockey experience and a degree in marketing, he moved through a series of jobs varying from working in a mill, to promoting tourism for the Quebec government, to writing a sports column for a newspaper. He eventually went back to school and earned a degree in education from the University of Ottawa—he now teaches elementary school. His inception as an author, however, would come years earlier, while he was still playing professional hockey. During a stint in Oklahoma City, Murphy suffered an extensive injury to his eye that required him to spend most of the season recovering. While he was waiting to get back on the ice, he spent some time helping his future wife, Melanie, with a creative short story assignment for a class that she was taking at LaSalle College in Montreal. Murphy helped her create some characters for the story, and his love for creative writing was born. Murphy says that he is not the kind of person to go only half way on things. He eventually hired an editor and an agent, and secured a publisher, Imajin Books. Dead Man’s Hand is available at Barnes & Noble @ RIT and on Amazon.com in paperback and for the Kindle e-book reader. Former professional hockey player and RIT alumnus Luke Murphy played center for a handful of minor league hockey teams after graduating from RIT. Here, he is pictured (middle) playing for the Port Huron Border Cats.